The 2nd edition has been thoroughly updated and revised in line with the very latest developments in the field. 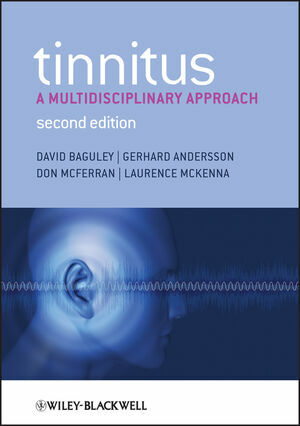 The book contains 40% new material including two brand new chapters on neurophysiological models of tinnitus and emerging treatments; and the addition of a glossary as well as appendices detailing treatment protocols for use in an audiology and psychology context respectively. Dr. David Baguley, Consultant Clinical Scientist and Head of Audiology at Cambridge University Hospitals, and Visiting Professor at Anglia Ruskin University, Cambridge, UK. Professor Gerhard Andersson, Professor of Clinical Psychology at Linköping University in the Department of Behavioural Sciences and Learning; Clinical Psychologist at Linköping University Hospital in the Department of Audiology and Guest Researcher at the Karolinska Institute in the Department of Clinical Neuroscience, Stockholm, Sweden. Mr. Don McFerran, Consultant ENT Surgeon at Colchester Hospital University NHS Foundation Trust, Colchester, UK. Also immediate Past-Chair of the British Tinnitus Association Professional Advisory Board. Dr. Laurence McKenna, Clinical Psychologist at the Royal National Throat Nose & Ear Hospital, University College London Hospitals; Clinical Psychologist at the South Maudsley NHS Trust and Honorary Lecturer at the UCL Ear Institute, London, UK. Also member of the British Tinnitus Association Professional Advisory Board.